Amaryllis lived in New York until her father, a surgeon, was drafted into the Navy during the Korean Conflict. He was “loaned” to the Marines, who stationed him at Camp Pendleton. The family relocated to San Diego, where some of her relatives still live, and later moved to Los Angeles. She attended Pacific Union College and Azusa Pacific University and pursued a career in child and family services for more than 40 years. “You can’t work in this profession and be afraid,” she says. “I’ve worked in every single housing project in L.A., and I was never afraid. I enjoyed my career, even though it frequently dealt with painful or stressful situations. 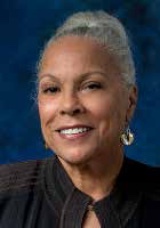 If I made one bit of difference to even one person, then it was worth it.” She retired as a deputy director of the Los Angeles County Department of Children and Family Services in 2010, and enjoys volunteerism as well as line dancing classes, which she attends twice a week. It’s no coincidence that Amaryllis’ serves on the David & Margaret board. “I’m totally, totally supportive of David & Margaret,” she says firmly. “When I was a young social worker, the agency received a call from a babysitter about a mom who didn’t pick up her child after seven days. The girl was 12 or so, middle school age, and she was so traumatized that she couldn’t talk. The sitter wanted to foster her but was not able to do so on a long-term basis. I would sometimes go to school and sit beside her, just so she would go in the door as she was in middle school, a most difficult period, particularly so for this young lady. Ultimately, David & Margaret accepted that child and helped her tremendously – that’s why I’ll always be supportive." “I’ve seen David & Margaret from every angle,” she adds, “as a placement worker, as a youth mentor, as a volunteer, and as a board member. I can see that David & Margaret demonstrates their belief in the value of children and young people and does much to help them reach their potential."